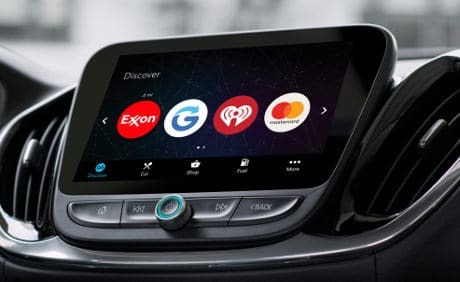 Drivers will soon be able to make purchases from within vehicles using their Masterpass account through OnStar — a subscription-based, in-car communications service and General Motors (GM) subsidiary. The Masterpass-enabled service, designed in collaboration with IBM, is to be embedded in “many GM vehicles” in 2017. “By embedding Masterpass within OnStar Go, Mastercard will enable drivers and passengers to safely make secure and seamless payments for goods and services using credit or debit cards stored within their Masterpass wallet,” Mastercard says. “With IBM Watson, OnStar Go enables merchants and brands to create new, connected driving experiences. For example, if a driver picks up breakfast from a specific restaurant that is part of the OnStar Go merchant marketplace, the restaurant would have the ability to prompt the driver to order menu items based on past order history. By combining OnStar with Watson — a cognitive technology platform available as a set of open APIs and software-as-a-service (SaaS) products — OnStar Go will also be able to enable experiences such as alerting drivers to traffic jams or letting them know when they are low on fuel and activating a fuel pump and paying from the dashboard. “With the customer’s consent, Watson will learn the driver’s preferences, apply machine learning and sift through data to recognise patterns in their decisions and habits,” IBM explains. “This information will allow brand and marketing professionals working with IBM and OnStar to deliver individualised, location-based interactions that directly impact their target audiences. ExxonMobil, Glympse, iHeartRadio and Parkopedia will be some of the first companies utilising the new service when it becomes available next year. An extension to OnStar enabled retailers to send drivers coupons tied to their specific destinations in January 2015. By the end of 2016, GM expects to have 12m OnStar-connected vehicles on the road worldwide. What happens to my itemised merchant receipt if I purchase in car?